So, it’s been a while since I’ve taken a look at a mechanical keyboard but the one I have here from Tesoro I think is worth a look. 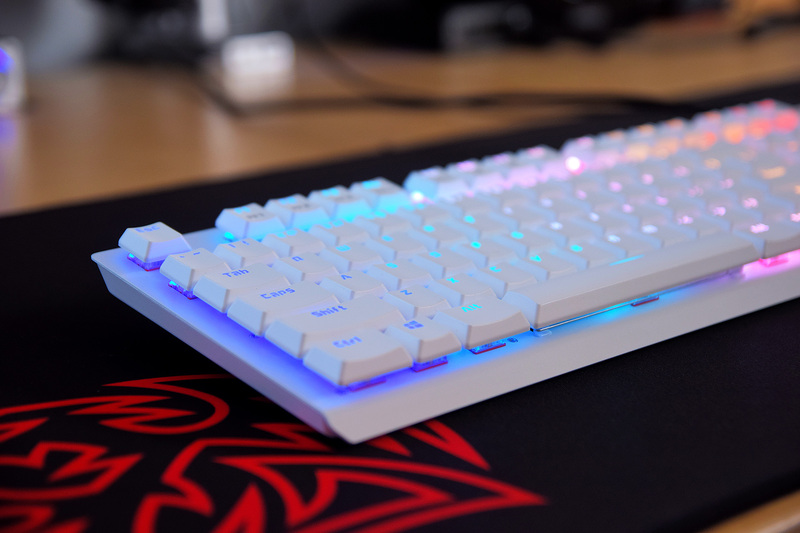 This is Gram Spectrum and the selling point for this keyboard is that it features some of the fastest mechanical switches on the market. One thing I like about this keyboard is that it’s got a pretty slim and low profile aesthetic, no guady bezel or gamery design despite being targeted towards gamers looking for fast actuating key switches. It’s also got a nice open design with the metal plate mounted switches showing off the inner workings of the keyboard. At the top of the keyboard, there is a detachable mini USB cable which I prefer. 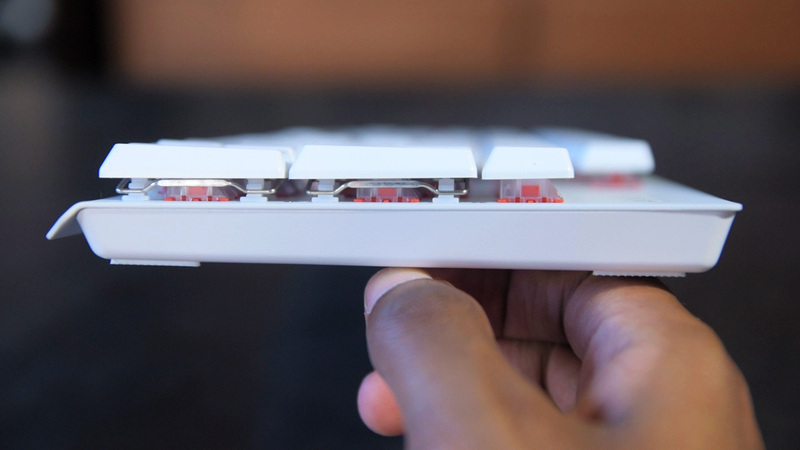 Unfortunately the white version of this keyboard comes with a black braided cable which stands out in comparison to the all white body. I’d be nice if they started packing a white cable with this version of their keyboard just for a more uniform look. As far as the keycaps go, you unforutnately do not get a standard bottom with this keyboard so good look looking for aftermarket replacements. You do get a series of function keys across the top row including 5 profile keys which will allow you to save multiple keyboard configurations, media keys which include your typical play, pause, mute and volume adjustments. There’s also buttons for 6 key or N key rollover, gaming mode, macro recording and lighting adjustments so you can technically make many of your changes without the use of any software. Pulling off one of the keycaps you can see it’s much shorter than a normal one, that doesn’t really mean anything from a functionality standpoint but it helps achieve the low profile aesthetic. The keycaps are also doubleshot ABS which is a nice upgrade over the printed keys we typically see on mechanical keyboards. And underneath the keycaps we have these NEW Tesoro Agile Switches. 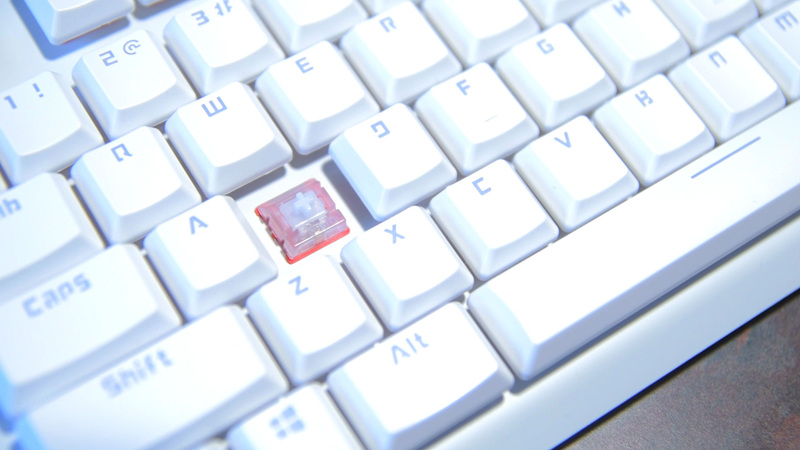 These are actually made by Kaihl and come in the red or blue variety but how these differ from the typical Kaihl or even Cherry MX switches is that they have a faster 1.5mm actuation point compared to 2mm on the others. The red version that I have here is also linear switch with a 45g actuation force. 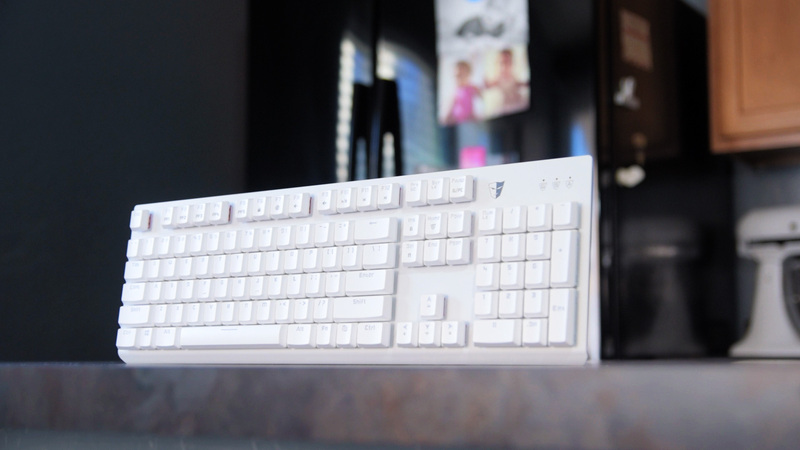 So in theory we should have faster keystrokes with the Tesoro #keyboard but is it noticeable in real world use? Let’s find out! So as you guys can see, I wasn’t able to show any significant difference between the switches in real world use however I will say that I do very much prefer the feel of the switches in the Tesoro keyboard in comparsion to the regular Kailh red switches which feel mushy and floaty if that’s a word. The only thing I don’t like about the typing experience with this keyboard is this…for some reason whenever the key rebounds to the starting position you hear this metallic ping sound…I don’t know if it’s something in the switch itself or vibration from the metal plate but it’s pretty annoying if I’m being honest so I’d like to see them address that. Now before we wrap this all up let me just quickly go over the lighting effects as this is an RGB keyboard. You of course get a solid color as well as Trigger, Ripple, Firework, Radiaton, Breathing, Rainbow Wave and Spectrum Colors. No complaints about the lighting options from me, the LEDs are nice and vibrant. I would prefer a different UI in the software though as well as a unified one because I had to download a seperate application to configure my #Tesoro mouse, not really a fan of that. But overall this is a good keyboard, didn’t make my gaming any faster but if they throw in a white USB cable and dampen some of the typing noise it’ll be a solid option for people. So that’s about it guys, let me know what you think down in the comments below. Don’t forget to like & subscribe and until next time…see ya! Corsair M65 PRO RGB FPS Gaming Mouse Review | My New Daily Driver?